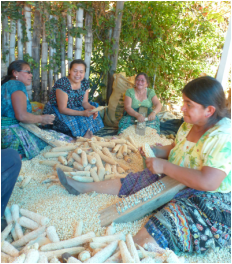 La Gente del Maiz documents an extended family of indigenous Tzutijil Maya as they work to process the year's corn harvest. I was profoundly moved by their labor, by their relationship with the corn and by their warm welcome of me and my camera. Corn, which is now grown around the world, was first domesticated by the Maya 7000 years ago from a wild grass with spikes, teosinte. The first ears of corn were less than an inch long. Now the Mayas carry burlap sacks higher than they are tall, full with long, heavy ears of corn from the campo. They save their best seeds for the next year --unless they are forced by hunger to eat them before the year ends. At the end of each harvest day, every kernel of corn is swept or picked from the ground; nothing of the corn is wasted. The stalks and most of the husks will be fed to the horses, the corn cobs are fuel for the cooking fires, the best husks will be wrappers for steamed chuchitos, Guatemalan tamales. Most of the precious kernals of corn will be ground and hand-patted into tortillas. The Maya's unbroken tradition of corn is increasingly threatened. Agriculture requires land, which continues to be taken from the Maya people through corporate agriculture, biofuel production and mining. In Guatemala, 50% of the children suffer malnutrition which continues to be a leading cause of death. The growing use of land for biofuel instead of corn production means that fewer Guatemalans can grow their own food as the land is being used for exported biofuel == few Guatemalans can afford to have a car themselves. Food is one of our most intimate and vital relationships. And perhaps agriculture has been humanity's most generous and skilled art. Please help keep the art of traditional agriculture alive. Thank you.